Opencart is a very user friendly and easy to use eCommerce CMS. It comes with several inbuilt modules, payment gateways and shipping methods. But sometime it requires to install other opencart extensions to enhance shopping. Installation of Opencart module is also easy or sometimes difficult too. In this post we will explain the different types of installation methods to install an Opencart extension. This method is very easy to install any module. This method works only on OCMOD installer extensions. If you have purchased a module from Opencart Marketplace which is OCMOD, then you can install it using Extension Installer. Logged in your admin panel. 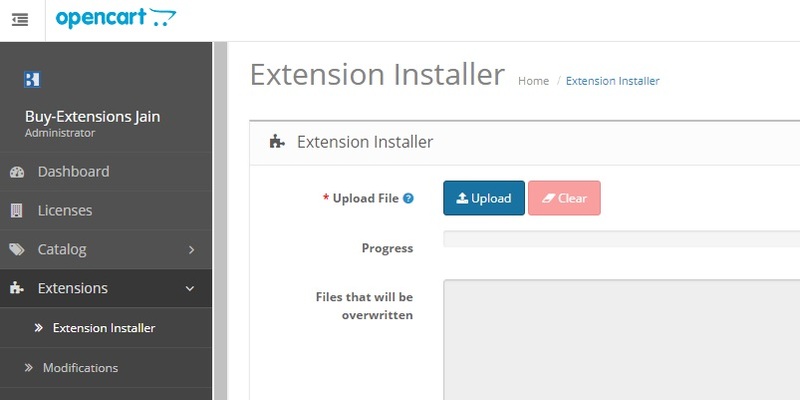 Go To Extension > Extension Installer, then click of upload button and upload OCMOD file. After upload Go to Extension > Modifications, then click on Refresh button, It will rebuild all modification. After that you can follow module installation instructions to enable and setup module. This method is very common and works on every Opencart version. In this method you have to unzip the opencart extension zip package and upload the files using FTP Manager (e.g. FileZilla, FireFTP) or Cpanel manually to website folder. Unzip the module package and extract the folder. Go to: Users -> User Groups and in section "Action" choose edit for "Administrator" group. Next, in field "Access Permission" and in "Modify Permission" click "Select All" and save changes. Click Install for the module you are installing.